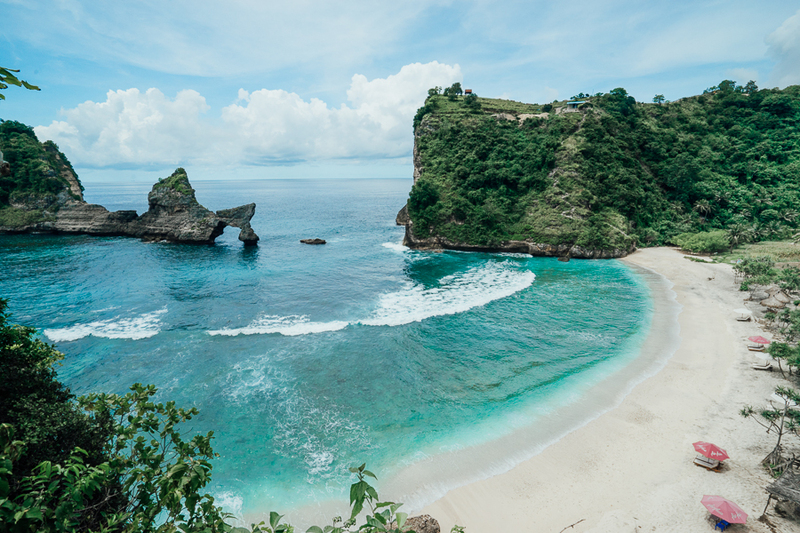 Nusa Penida is the biggest of the three Nusa Islands just off from mainland Bali. Nusa Lembongan and Nusa Ceningan make up the trio of islands, each with uniquely breath-taking landscapes. 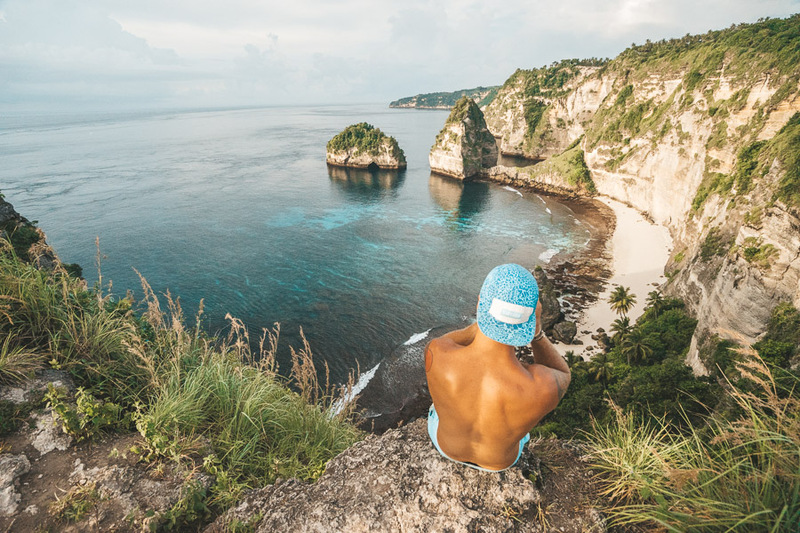 There are so many awesome things to do on Nusa Penida but let’s get started with the logistics. From Nusa Lembongan, the boat to Nusa Penida took only 20 minutes and cost $35 USD split between my two friends and I. However, you can make a day trip from mainland Bali to Nusa Penida. I have now visited Nusa Penida twice. The first time I only came for one day (7 hours) and this was a huge mistake. You definitely need to spend at least 2 days if not 4!! This way you can fully explore all of these cool spots rather than just getting a glimpse at each location. Our first stop was unbelievable! The Pura Goa Giri Putri Cave is perched midway up the mountain, accessible by a steep winding staircase. Before being allowed up the staircase we had to rent a sarong for 50 cents. We dodged a few rogue monkeys before arriving into the middle of prayer. With no idea what he had walked in on we were blessed with some water to the forehead before crawling through a tiny crack in the ground. Over 100 other people joined us down, crawling through the crack. Once inside, the roof opened up and we were inside a 300m long cave. More prayer was underway but no-one seemed to mind us looking around. I would have loved to yell out and hear the echo in this massive underground temple. Instead, we wandered around, enjoyed the smell of the incense and the eerie atmosphere before crawling out again. After the interesting cave experience, we headed to the coast. We drove through a collection of villages waving to the kids as we dodged chickens, dogs, and potholes on the road. The poor road soon turned to a dirt hill so we abandoned the bikes and crossed our fingers we were in the right spot when all of a sudden we spotted an amazing view through the branches. Atuh Beach is a stunning white sand beach surrounded by the huge cliffs and remarkable rock formations. An arch sits directly out from the shore while several islets string off in the distance. We explored the shore and the ocean before enjoying a fresh $2 coconut. Air Asia knew what they were doing when they provided these umbrellas to the resorts. I can’t imagine how many Instagram photos have inadvertently advertised the airline. Peguyangan Waterfall is one of my favorite spots on Nusa Penida because it has a mix of everything. Up and down those steep blue stairs is a workout. Then you add in the spectacular coastal cliff views that are the trademark of the island. Finally mix that in with the tradition and culture of the sacred temple and the waterfall, which is a pilgrimage site and you have this awesome blend in one spot! The hike down takes about 20 minutes, leading you down to the pilgrimage site. The sacred temple is based on the water blessing. 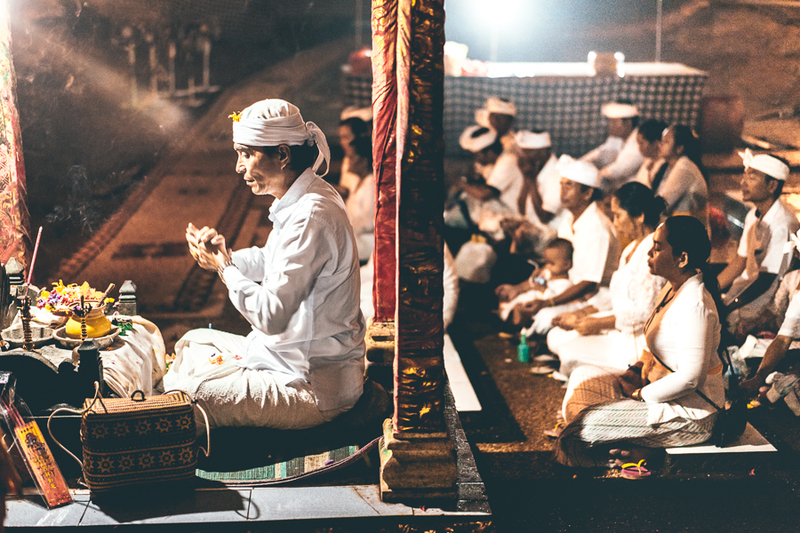 I spoke to one of the locals who was going through his ritual. There are three spouts. In order, they must shower underneath each and then use the fourth main spout to finish. This is how they cleanse themselves and receive blessings. I didn’t go under the three smaller spouts but the local guys who were dressed in just a sarong or underwear for the boy invited me to shower under the main spout. 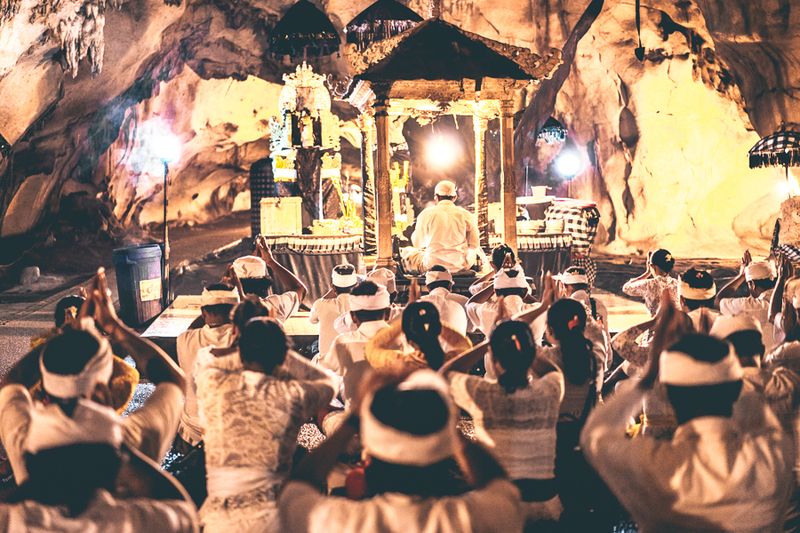 Shrines and trinkets are spread throughout the sacred site, which eventually leads you down to cascading pools. These pools have the purest of water, it looks like bottled water it’s so clear! The rock pools are tiered down until they eventually flow out into the ocean. It’s a really beautiful area and has so many different things going on. As we left there was a ceremony taking place with 20 locals sat on the ground being led through a prayer. If you don’t like heights skip this trek. The path is at times less than half a yard in width. On one side is the giant vertical rock wall and on your other side a tiny wooden fence protecting you from a certain death if you were to fall. The fence looked like something you would see on an old farm. Nevertheless, we made the journey down with a self-appointed guide who insisted on joining us. He was incredibly funny despite not speaking any English. At each scenic point, he would throw his hands up and scream wow, motioning to us to take a photo of him. The trek was incredible, which made up for the waterfall. We were dripping with sweat, my friend Joel had cut up his leg and we were out of energy hoping to find an amazing waterfall running into the ocean. Once at the bottom we were surprised to find a cascade of trickles running down the rock face. It was an anti-climax after the crazy trek down. 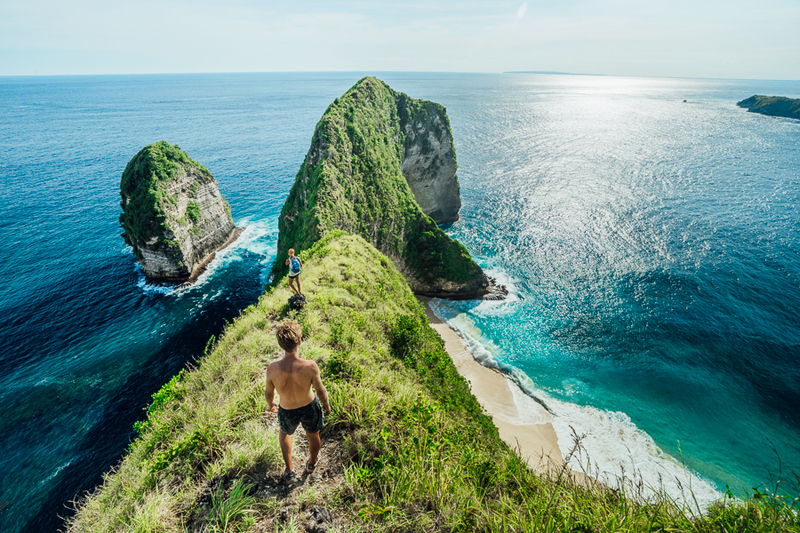 I would suggest this trek as it was truly one of my favorite things to do on Nusa Penida. However, don’t expect Niagara Falls at the bottom. The Instagram famous coastal cliffscape, which truly does look like a T-rex didn’t disappoint. I still remember the moment I laid eyes on the beach below. It felt like I was a human drone. I watched the crystal clear water slowly form into a wave before crashing below us, in what seemed like slow motion. We took a short trek down the spine of the T-Rex and took in the epic drop-offs down each side. This is definitely my favorite thing to do on Nusa Penida and is just one of those landscapes that make you feel small. It makes you feel lucky to be in its company, to be able to witness earth’s creation. Nusa Penida has so many amazing views making it hard to pick a favorite. But when the cliffs form in the shape of a Tyrannosaurus Rex at Kelingking Secret Point Beach it is bound to be a crowd favorite. Kelingking actually translates into English meaning Pinkie a term referencing the smallest finger on the hand. Just like a pinkie promise, the land does also appear to take the form of a Kelingking or pinkie finger. However, it is the comparison to the T-Rex that has caused this location to become so popular. 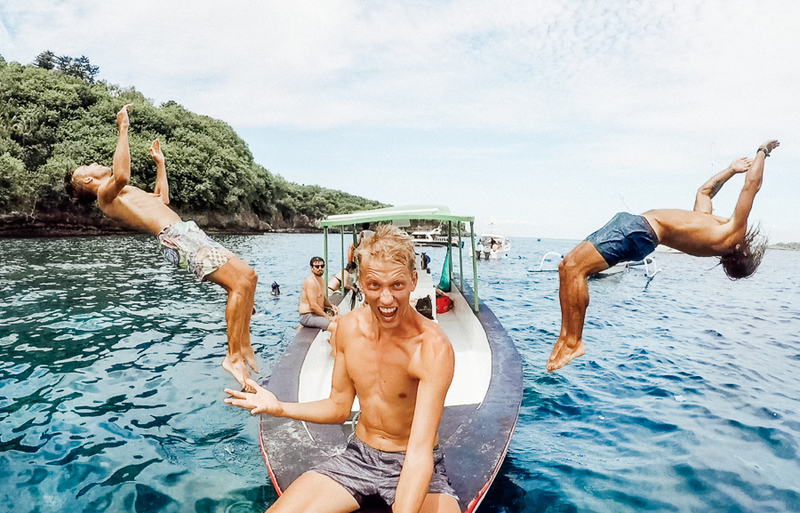 We hopped on a group snorkel tour from Lembongan with one thing on our minds. 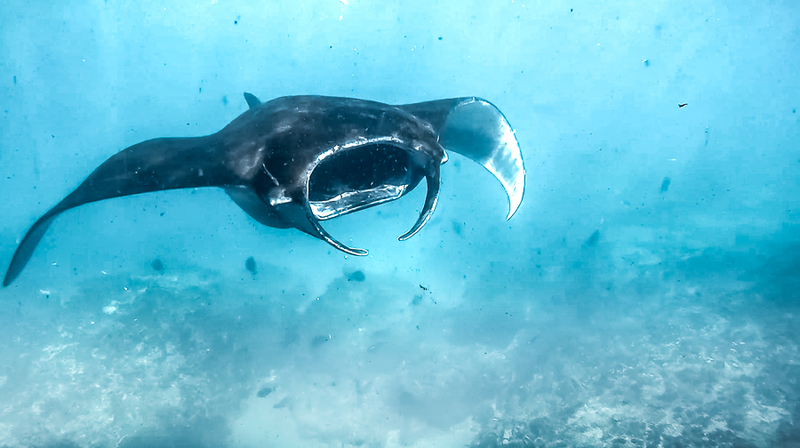 We were keen on swimming with giant Manta Rays as is a popular thing to do on Nusa Penida. After initially not being able to locate the Manta Rays our awesome captain found them. We were able to swim and snorkel with the playful Manta Rays for over half an hour. 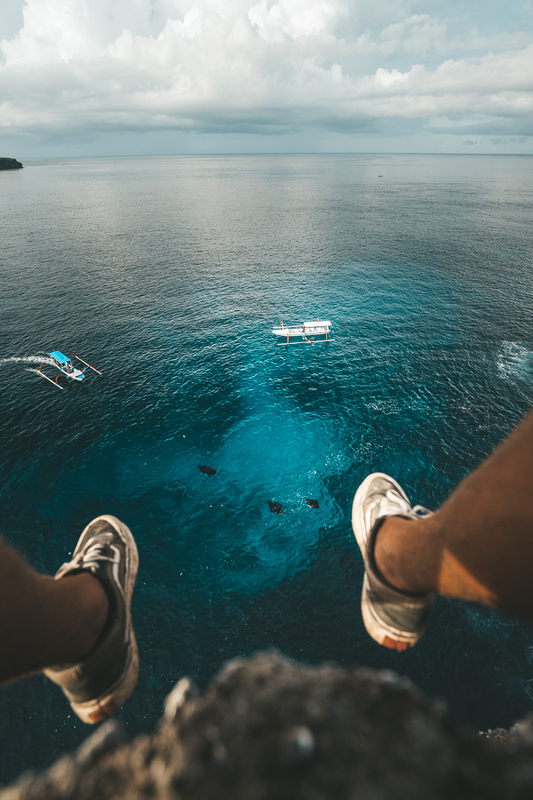 You can book a tour locally for about $20 USD if you are already on Penida or Lembongan or you can book online before you arrive with Viator by clicking here for the top rated snorkelling tour if you are going to be in Bali. Alternatively, you might prefer to go scuba-diving with the Manta’s, which would be the most magical experience ever. By now we were all so tired from swimming non-stop all morning that when we arrived at Crystal Bay we slumped on the sand and began an hour of recovery! Our captain then rounded us up and took us 100 yards out into the bay on the boat and we enjoyed the crystal clear water you would expect at Crystal Bay. Although we were more interested in flipping off the front of the boat. What’s new? Our final stop on our Nusa Penida journey was to Toyapakeh. This awesome snorkel spot has a strong current. Our captain dropped us off and we hardly had to swim as the current slowly drifted us down towards a small cove. We were drifting on the edge of a huge drop-off with fish and coral in abundance. As with all tidal pools you need to arrive at the right time of day. If you visit Angel’s Billabong during high-tide you will experience a very different pool than the one you see in photos. You will need to check the tide using a site like Magic Seaweed. Once you figure out when the low tide is, you should plan your itinerary around that. On the day we wanted to visit Angel’s Billabong the low tide was at 8 am so we arrived right at 8 am and it was perfect. The Billabong is a remarkable formation. The crystal clear water allows you to see the patterns and textures beneath the surface. In some areas, the water is deep enough for a little dip! It is a highly photographed spot on Nusa Penida because of how unique the landscape is. 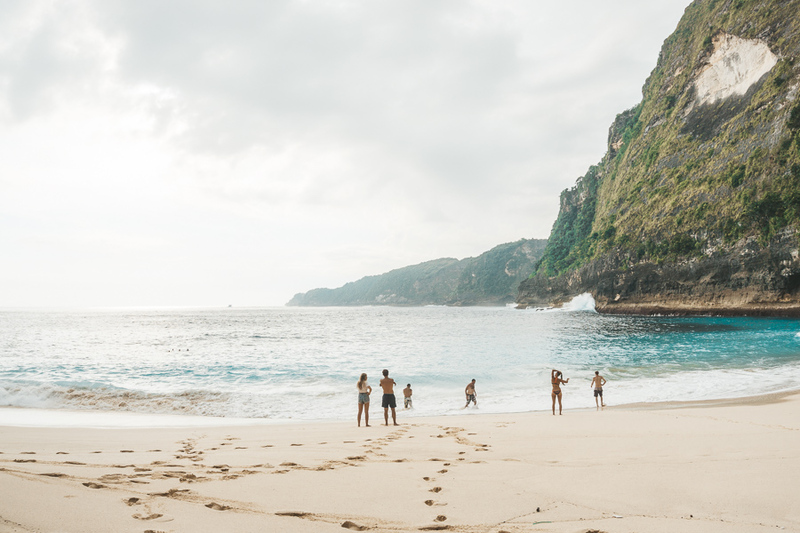 Broken Beach is an incredible little cove on Nusa Penida island. The highlight of the cove and the reason it is called Broken Beach is due to the archway that wraps around the bay allowing water to flow in and out from the ocean. All around the world, there are unique ways in which the earth has eroded over time. Sometimes mother nature leaves us with something quite remarkable. 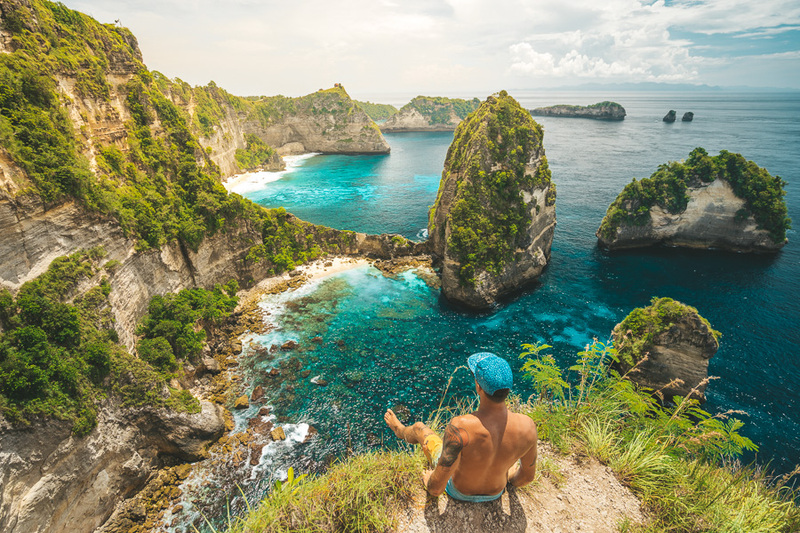 On Nusa Penida, one of those places that leave us in a state of awe at how over millions of years the earth has ended up as beautiful as it appears before us right now! The arch at Broken Beach has been formed over many, many years and is now a true spectacle. From above the cove appears almost circular and closed in, however, at eye level the arch is quite high. Unfortunately, there is no way down into the cove for a refreshing dip although you can get in the water at Angel’s Billabong around the corner. Firstly, you might be wondering what Pulau Seribu means and it actually just means Thousand Island. This location is sometimes referred to as Pulau Seribu and sometimes as the Thousand Island Viewpoint so I thought I would reference both. There are several viewpoints that have had fences and structures added to them for the benefit of tourists. There are huge drop-offs here so the fences are to keep tourists safe! To get to the first viewpoint you need to climb down the steep stairway for about 10 minutes. Once we reached this first viewpoint we were pretty awestruck. The view is incredible! We could see a small little empty beach sitting at the bottom of the cliff. It was paradise. We continued on to the second viewpoint and then to the Instagram famous Tree House. There was nobody inside but the door was locked. We took a few photos here and debated whether or not we would stay out here. We all concluded it would be worth it for the feeling of enjoying the sunrise on the balcony of the treehouse! As you finish up at Angel’s Billabong it is common to walk around the corner to Broken Beach. The walk only takes 5 minutes but halfway through the journey is an archway made of trees. When you reach this archway don’t go through immediately! Head up the hill towards the coast on your right and look down into the ocean. This is where the Giant Manta Rays hang out. We sat on the cliffs watching the Mantas cruise around and surface time and time again. It was a pretty awesome discovery and we have aptly named the cliff, ‘Manta Ray Viewpoint’. After trekking down the stairs you will find another set of even steeper stairs on your right, which lead to the beach. When we reached the bottom of the stairs and hit the sand the waves were insane. It is a shore-break beach and the waves were barreling and dumping. This isn’t a beach for novice swimmers and the sets came out of nowhere. Please don’t swim if you aren’t 100% sure you can handle the conditions. My friends and I body surfed until the sunset. It was the most magical night of our time on Nusa Penida. Kelingking Secret Point Beach was and still is my favorite spot on Nusa Penida. Here is a great little tip for enjoying Kelingking Secret Point Beach from a unique angle. 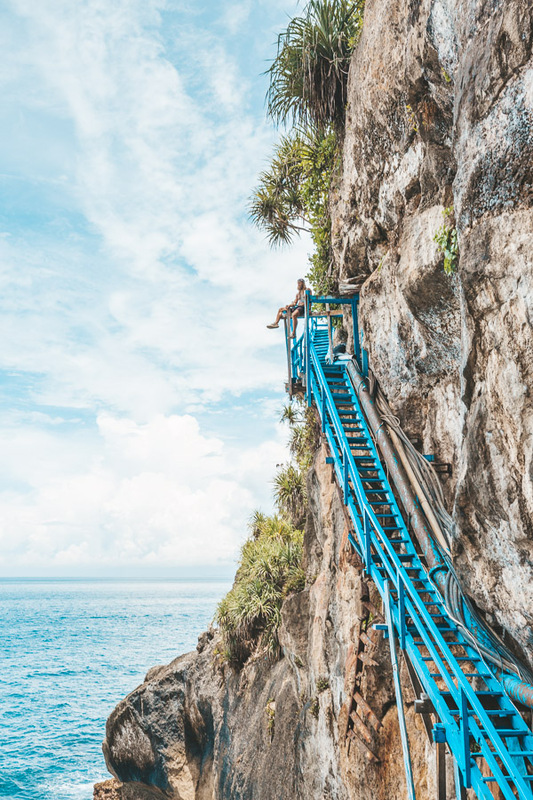 Instead of hiking down the stairs, head to the right along the cliffs. There is a worn path along the cliff edge but no railing so be careful. Here you can find multiple epic viewpoints, with arguably a better look at the beach than the hike. It’s an awesome spot for sunset and doesn’t involve any hiking for those of you out there looking for the easy option. We came back two nights later after our beach session down at the bottom and just caught the sunset up on these cliffs. Definitely one of the best sunset spots on the island of Nusa Penida and a unique angle of Kelingking Secret Point Beach. The Tree House (Rumah Pohon) on Nusa Penida has become something of a craze. It is perched up on the mountain at Thousand Island (Pulau Seribu) viewpoint near Atuh Beach. 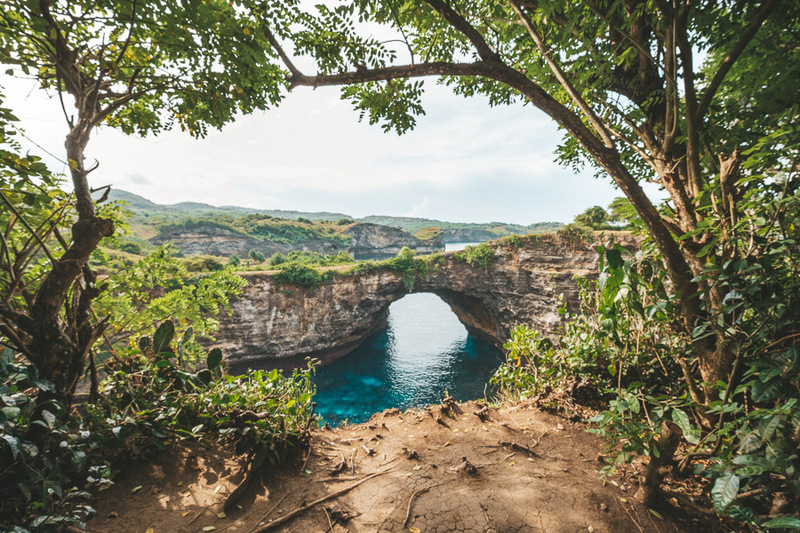 Thanks to some talented photographers who shared this spot on social media, it has landed itself on the Nusa Penida bucket list of many travelers. It is part of the Thousand Island viewpoint area costing only 10,000 rupiah to park and enter, which is less than $1 USD. The best part about this treehouse is that it is actually a house and you can rent it out for pretty cheap considering how popular this spot has become and how insane the view is. 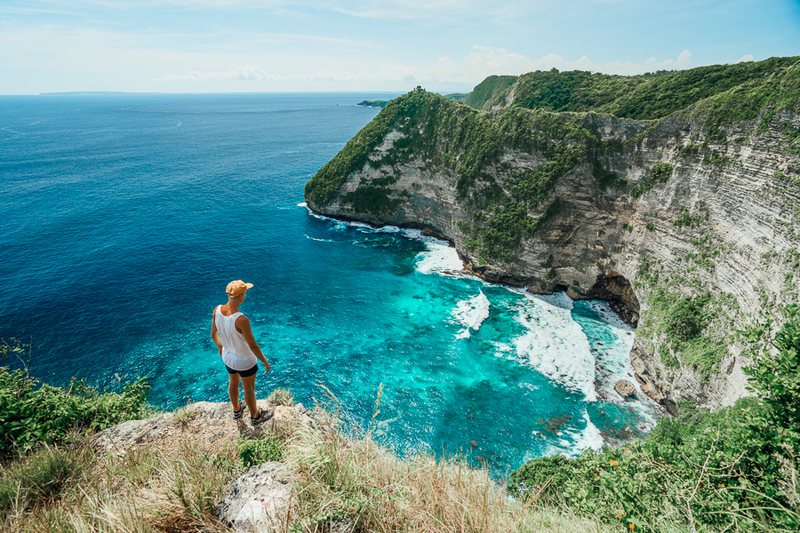 Banah Cliffs is another epic viewpoint on Nusa Penida. The view down the coast at Banah is striking. As we sat on the edge and looked down we couldn’t even figure out how big the drop was. When we threw a rock off the edge, we never saw it hit the ground, such was the scale. The cliffs are known as a great sunset spot just like Kelingking, which is just down the road! There are two defined ‘spots’ at Banah Cliffs, one involves a short walk and one is right next to the parking lot. The highlight at Banah Cliffs is the arch out in the ocean. A small rock arch sits out in the crystal clear water. We spent a couple of hours at both sites at Banah Cliffs taking in the epic coastline. On the right-hand side of Atuh Beach is a staircase that leads up the hill. At the top, you will find a parking lot and likely a local who will charge you 10,000 rupiah whether you have a car/moped or not to enter. The viewpoint is next to Atuh Beach but looks out over the bay next door. You can get the Atuh Beach view from both sides but I assumed you guys would find that anyway. 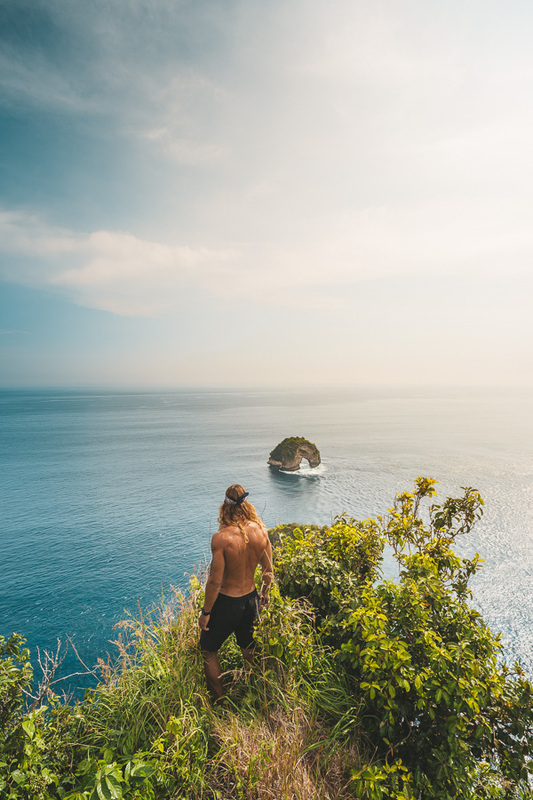 This is just an epic little spot we stumbled upon and It’s a pretty epic viewpoint though so when you are at Atuh Beach definitely get up to this side of the beach and check it out. Here is a quick snap we grabbed looking down the coast from this spot. Nusa Penida Island is quite large compared to Nusa Ceningan and Nusa Lembongan. Therefore you may want to consider spending 2-3 nights on the island if you would like to see all of the points of interest without having to rush. The roads in some parts are fantastic but to get to many of the waterfalls and beaches the roads were pretty crazy. At times we were just driving over small rocks. If you aren’t confident on a moped this could be some terrain too heavy to handle. There were a few spots that locals asked us to pay a small entrance or parking fee at. For example, as we left Kelingking we had to hand over 50 cents for parking even though nothing was mentioned beforehand. Just enjoy the views hand over the small fee and continue on your journey. 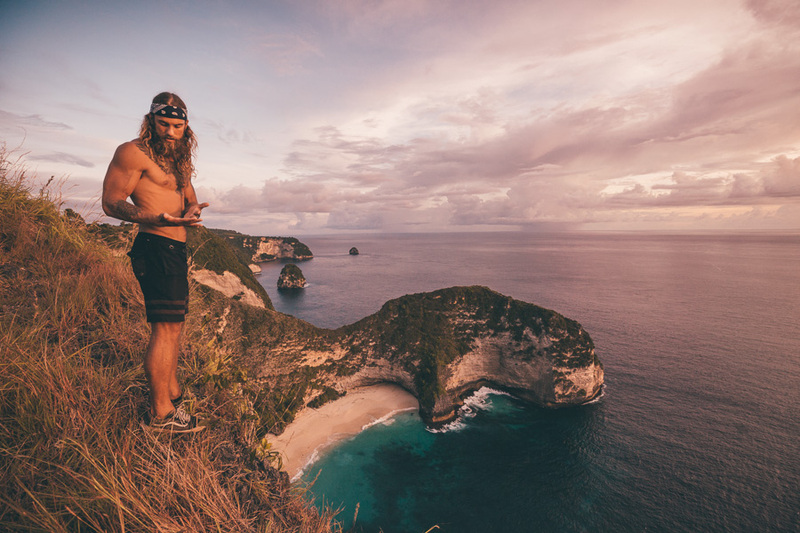 There’s a ton of epic things to do on Nusa Penida, but I also wrote detailed guides for all of the adventurous things to do on Nusa Lembongan, Nusa Ceningan, and the Nusa Islands as an overall guide.